Is it any better with pickles? According to The Mid-Century Menu, the pickles definitely added flavor; just not necessarily good flavor. 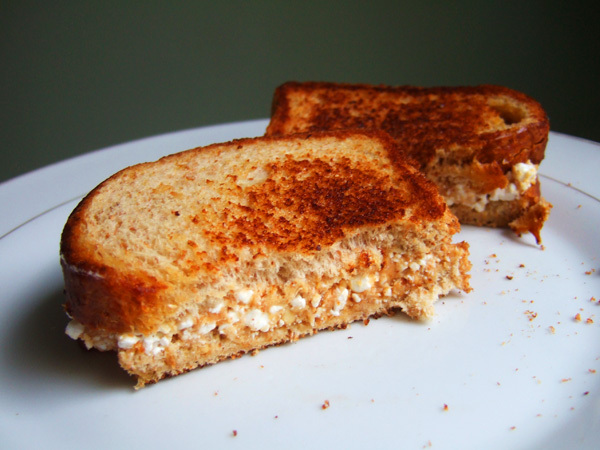 My dad was a lover of peanut butter and pickles… I failed to be a convert. Hmmm…have to give that a try. It’s sort of like a “vegan” sausage. The luch looks… not terrible. 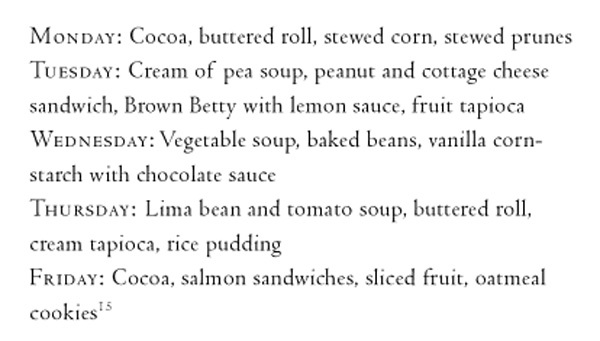 I wouldn’t mind eating this (except Monday-stewed corn, even with stewed prunes (ick) seems like not much lunch). I find it interesting that most of thins looks vegetarian (depending on what is in the soup stock), and I wonder if that is a cost measure, or a simple way to make sure that even the kids who keep kosher can eat the lunch provided. Both, but I think more of the latter. I was told that the first schools in New York to have the lunch program were all on Broome street, the heart of the Jewish Lower East Side at the turn of the century. It would make sense that to avoid the whole kosher issue, they kept it veg. School were the students keep kosher do they same thing today; I had a field trip that came to the Tenement museum once from an orthodox school that was so excited they went to a local Kosher deli and got a meat meal for lunch. But notice they do serve fish on fridays! love it! you have such an engaging writing style. and i really hear your voice! I love The Lower East Side Tenement Museum! I visited there 10 years ago. It good to see they are still doing well. The foods tour sounds awesome. I wish I could come up and check it out, but thanks for posting this! I think the acid would have broken up the blandness, for sure.